magnasite and handlooms. Kottai Marriamman Temple and Sugavaneswarar Temple are located in the heart of the Town. There is a Government Museumin Salem near to the Collectorate. 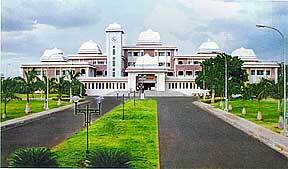 Tharamangalam is situated 27kms from Salem. The place is famous for Kailasanathar Temple. It has beautiful statues and stone carvings. Figures of tortorise , fish , monkey , Crocodile are carved out the walls and granite roofs. Statues of Rathi - Manmatha , Vali- Sukrive of the epic Ramayana and Yali with rotating stone ball in its mouth. The rotating lotus flower in the seiling are some of the beautiful futures,which adorn the Temple. Mettur Dam The major dam of the state across the river cauvery has been constructed in a gorge during the year 1926 . It provides irregation facilities to Erode , Trichy and Thanjavur Districts for thousands of acres of land. It is a picnic spot situated 52 kms from Salem. A beautiful park opposite to dam formed with Lawns , Parks and children play materials. A Hydro Electric and Thermal power stations are also located in this town. It is an industrial centre for Aluminum and chemical products.